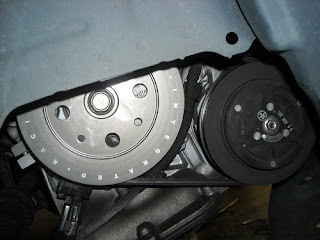 Redline high performance lightened crank pulley, to improve acceleration respond and torque.. Constructed out of grade 7075-T6 aerospace aluminum for its higher tensile strength & light weight properties compared to conventional pulleys made from 6061 grade. Features ultra hard anodizing (evident in the gunmetal color) for superior resistance to friction, ensuring ultra durability. O.E sized (no underdrive) - suitable for street cars / daily driver running extensive I.C.E, and suitable for both manual or auto trans.